Do "Detox" Diets Work? Are They Safe? Many people are always looking for a quick way to lose weight and feel better. "Detox" (short for detoxification) or "cleanse" diets promise to eliminate toxins from the body and jumpstart weight loss, and they're going more and more mainstream. But nutritionists and others are expressing reservations about them, while acknowledging they do have their good points. Registered dietician Keri Glassman discussed their pluses and minuses on The Early Show Wednesday. What exactly is a detox or cleansing diet? Their advocates say our bodies are constantly overloaded with toxins from pollution, cigarette smoke, alcohol, caffeine, and processed foods. The thinking is that, as these toxins build in our bodies, they can be responsible for a number of health problems, such as weight gain, energy loss, and dull skin. You then rid your body of toxins by following a special diet that significantly restricts and reduces food intake. There's not just one detox diet, there are many different types, from juice fasts to raw food diets to plans that only include fruits or don't allow chewing. If you assume cleansing diets are just a New York-L.A. trend, you'd be wrong. The Los Angeles Times says "Master Cleanse" was the most-searched recipe on Google in 2007. Also last year, sales of herbal cleansing products tripled to nearly $28 million worldwide, according to Spins, an Illinois market research company that specializes in the natural products industry. The can cause peope to lose weith too quickly. Despite all that, Glassman isn't completely against detox diets. She often puts her own clients on detox for two or three days -- not so much to rid their bodies of toxins as to give them a mental jump start to eating better and losing weight. One upside of cleansing diets, she says, is that they make you think differently about the food you put into your body, and so they have the potential to permanently improve your eating habits. If you're thinking about embarking on a cleansing diet, Glassman advises that you choose one that still allows you to actually eat. The best diets eliminate alcohol, caffeine, meat, and most dairy; they focus on whole foods such as vegetables, fruits, nuts, beans, whole grains, and lots of water. However, you don't want to permanently eliminate dairy from your diet. Most cleansing plans call for this in the beginning because dairy contains lots of calories and sugar, but you should plan on reintroducing small amounts of low-fat diary after finishing your cleanse. Glassman considers this one fairly reasonable. The goal is to improve liver function, which will then lead to weight loss. It's an eight-week, low-fat diet that emphasizes plant foods such as veggies, fruit and juicing. It also allows poultry and fish, but not dairy. it calls for drinking lots of water -- 8-12 glasses a day. Selenium, from Brazil nuts, kelp, brown rice, garlic and onions. This is what many people think of when they picture a cleansing diet. It was actually developed in the 1940s, and popularized by a book in the 1970s. For a minimum of 10 days, you drink only a lemonade mixture: organic grade B maple syrup, fresh-squeezed lemon or lime juice, and cayenne pepper added to spring, distilled, or purified (NOT fluoridated) water. (RECIPE: Two tablespoons of Grade A maple syrup, juice of half a lemon, 1/10 teaspoon of cayenne pepper, and a quart of spring water). Once back to a regular diet, continue with the lemonade for breakfast. Once back to a regular diet, you include only small amounts of meat and no milk products, which supposedly may produce mucus and hinder digestion and absorption of nutrients. Not surprisingly, Glassman does NOT like this diet. She points out that it contains no protein, vitamins (except C) or minerals. In other words, you are starving your body. She says you are guaranteed to gain weight after going off of the plan. 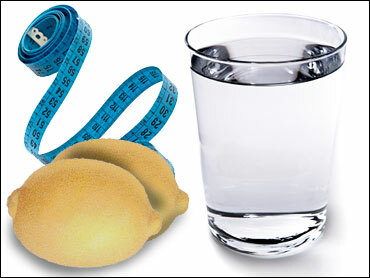 This is essentialy a liquid diet that dictates only taking in 1,000 calories a day. Every two hours you drink a designated liquid. By day's end you've consumed 40-48 ounces of water, 32-40 ounces of herbal tea, 16 ounces of vegetable-based soup, and 32 ounces of either a green drink made from vegetables, vegetable juice, or a berry drink. There are no foods to chew because the goal is to "rest the gastrointestinal tract." It's suggested that you take vitamin, mineral and antioxident supplements during the cleanse. While Glassman says this diet does offer some good suggestions on how to reduce or eliminate high-fat, high-calorie processed foods from a diet, she points out that it's quite difficult to maintain. And again, there's no scientific evidence to prove the diet actually cleanses your system.